By Kamome Shirahama. Released in Japan as “Tongari Boushi no Atelier” by Kodansha, serialization ongoing in the magazine Morning Two. Released in North America by Kodansha Comics. Translated by Stephen Kohler. For the most part, this is a title filled with whimsy and wonder, and Coco is a bubbly, happy hero. I say for the most part because the circumstances that lead to her becoming a witch are creepy and scary, and essentially a child’s worst nightmare. Fortunately the witch from the earlier chapter is able to help her, and she gets taken away to magic school to essentially start starring in Harry Potter. She gets a few new friends, and also a roommate who really does not like her, in the best boarding school tradition. Most of this volume hinges on the fact that Coco has absolutely no training in this sort of thing whatsoever, and things that are common knowledge to all witches are new to her. This allows the reader to receive an explanation, of course, but also helps to show off how Coco seems to be a prodigy as well – she soaks up the information quickly, and can extricate herself from life-threatening situations. The rest of the cast is not as fleshed out as Coco, but it’s a good start. Mostly we focus on Qifrey and Agott. Qifrey seems to be the sort of pleasant mentor who will have a bit of a dark side later on, sort of like Dumbledore (well, hopefully not THAT much like Dumbledore). Agott makes the stronger impression, and it’s not a good one at first, with the line “such a shame about your mother” wriggling with unspoken contempt. Agott and Coco are meant to contrast heavily, and Agott is also clearly meant to be the favored student who gets shown up straight away by the new girl. Will they eventually bond as friends? Not sure, but things aren’t looking good right now, as Agott sends Coco out on a deadly test and does not seem to be punished for it at all. 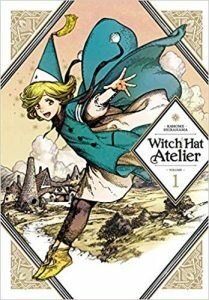 So, to sum up: magical fantasy, spunky young protagonist, rivals and companions, a mysterious past, and excellent artwork. It’s a terrific start to a series.